It can be hard to lose weight in Beverly Hills with so many quality restaurants lurking around every corner. Planning what and when you will eat can help you to cut calories and learn better portion control. Once upon a time eating seven meals a day was a hilarious notion. But in today’s society, many of us seem to eat more like hobbits than we do like people. Sure second breakfast may sound absurd, but what about fourth meal? That’s more than a marketing tactic; it’s an excuse that way too many tired and overweight adults use to indulge in a midnight snack. 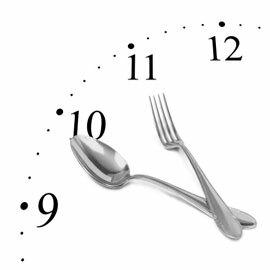 To lose weight it is time to put down the fork. Too many people are not taking enough time in between meals to ever actually feel hungry. The concept of eating multiple small meals throughout the day works if you are properly reducing your portion size, but if your meals are coming out of drive thru windows then there may be a really big problem with how you are structuring your diet. The concept of three-square meals a day is pretty ingrained in our society and for good reason. Our bodies are naturally hungry around these times. We wake up and want food to help us power through the day. After a morning of hard work we need refreshment to rejuvenate our spirits and make it through the afternoon. When the day is done, our body needs fuel so that it can recuperate and be ready to go again tomorrow. When our meals are balanced in this way there isn’t a lot left over for storage. The problem starts when we eat too much and don’t work hard enough to burn it off. That is when fat starts to develop, and that is why so many people are struggling with obesity right now. Be honest, when was the last time you were actually hungry? A lot of people couldn’t imagine going a full eight hours without having a bite to eat, yet millions of people go hours in between meals without ever stopping for sustenance, while their co-workers barely go 20 minutes without munching on something or other. These are two ends of the same spectrum. Finding a spot on the spectrum where your body functions at its best will help you to lose weight and feel a whole lot healthier. When you wake up in the morning, decide what you are going to eat during the day. Assign times to certain snacks and meals and if you get hungry in between those times pour yourself a glass of water and wait. Count your calories in the morning, not at night. By planning your calories instead of just adding your calories you will have more control over how much you consume every day. Drink more water. It may sound like an old cliché at this point but a lot of times we turn to food when our body is really craving water. Staying hydrated can cut down your hunger pangs.